The rise in incidence of childhood obesity is a major concern that has been associated with lifelong health problems. The majority of exercise to counteract childhood obesity has focused on aerobic exercise as a method to improve body composition. Although aerobic exercise is appropriate, resistance training may offer unique benefits over aerobic exercise including decreased risk of weight-bearing overuse injuries, decreased thermal stress and improved self-esteem. McGuigan et al from Edith Cowan University, Australia, investigated the effects of an 8-week periodized resistance-training program performed 3 days/week on body composition for 48 children classified as overweight or obese. Measurements were taken at baseline and after 8 weeks of training. Body composition was measured using x-ray absorptiometry. Height and weight measures were also recorded. Strength was measured using a machine squat exercise, muscle endurance was assessed by asking the child to perform as many push-ups as possible, and power was measured using peak power and vertical jump height while using the Ballistic Measurement System. Participants kept diet and activity logs to identify any significant changes in variables. Children were then placed in a resistance training program that incorporated minimal equipment, including dumbbells, elastic bands, medicine balls and weight bags. Training loads were varied, and intensity increased weekly for all exercises. Following 8 weeks of training, the children showed a significant decrease in absolute body fat of 2.6%. A significant increase of 5.3% in lean body mass was noted as well. Significant increases in pre- and post-training strength and power measures were also shown. Specifically, the variables included increases in 1-repetition maximum squat, number of push-ups, countermovement jump height, static jump height and power. 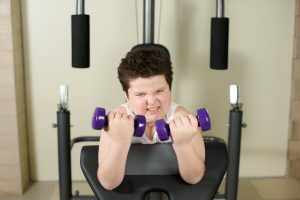 The researchers concluded that a properly implemented resistance training program can produce significant changes in body composition, strength and power measures, and can be well received by children who are overweight and obese. Because such a program can lead into changes in lean body mass while reducing body fat, researchers suggest that resistance training programs could be a preferable alternative to aerobic exercise programs. McGuigan MR, Tatasciore M, Newton RU, Pettigrew S. Eight weeks of resistance training can significantly alter body composition in children who are overweight or obese. J Strength Cond Res 2009;23:80-85.